Editor's note: For details on the Rasmieh Odeh case and the intense support behind her, see our series, "Spinning a Terrorist Into a Victim," here. As she fights to block a psychological examination by a government expert, convicted Palestinian terrorist Rasmieh Odeh added a new member to her defense team, one who shares her intense hatred for Israel. 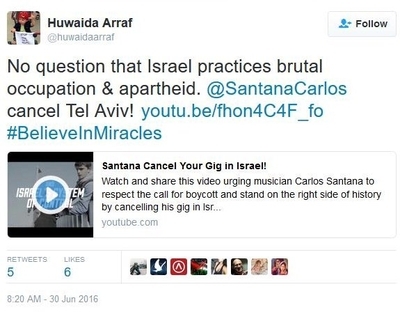 Huwaida Arraf helped organize the 2010 flotilla aimed at breaking Israel's blockade of Gaza by delivering humanitarian supplies. The blockade was implemented to prevent the Hamas government and other terrorists from smuggling materials that can be used to make bombs and rockets. The flotilla, and similar convoys which claimed to be delivering aid to Palestinians in Gaza, worked closely with Hamas officials in Gaza. The flotilla ended in a violent confrontation on one ship after passengers attacked Israeli soldiers with knives, pipes and other weapons. Arraf was on a separate ship, but still is suing the Israeli government claiming mistreatment when the flotilla was intercepted. Among the allegations, her handcuffs were too tight. Odeh, meanwhile, is trying to persuade a federal judge in Detroit to grant her a new trial for naturalization fraud. She was convicted in 2014, but an appeals court ruling could lead to a new trial in which jurors would hear Odeh's claim that she suffers from Post-Traumatic Stress Disorder (PTSD), supported by her own psychologist's testimony. 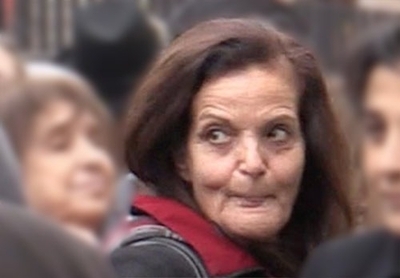 When applying for a visa to come to the United States, and later when she sought naturalization as an American citizen, Odeh failed to disclose her arrest, conviction and 10 year imprisonment in Israel for her role in a lethal 1969 Jerusalem supermarket bombing that killed two college students. During her trial, immigration officials testified that Odeh never would have been allowed into the United States, let alone granted citizenship, had they been informed of her terrorist history. Odeh claims the omission was unintentional, the result of PTSD she suffers from due to alleged torture while in Israeli custody. Her confession, she says, also was the result of the alleged torture. There is no physical evidence for this claim, and it has been contradicted by records created at the time and by Odeh's own testimony two years ago. Such testimony was barred during the original trial, but the Sixth Circuit Court of Appeals ruled in February that U.S. District Judge Gershwin A. Drain's ruling was flawed. The appellate court remanded the case, saying there might be other reasons that are legally valid to exclude the PTSD testimony. That will be determined at a hearing scheduled for Nov. 29. If Drain rules that the PTSD testimony should be heard, Odeh would get a new trial in January. If not, the conviction stands, pending another likely appeal. But the judge who must decide whether such testimony is both relevant and valid should rely solely on the defense's expert, Odeh's attorneys argued in court papers last week. Any additional mental evaluation carries "the grave risk ... [of] a serious aggravation of her symptoms and the suffering they cause her," the defense argued. The government review is described as inherently hostile and "bent on" discrediting Odeh. This, the defense reply says, "will plunge [Odeh] to the depths of ghastly 'flashback' memories which have afflicted her life for all these years..."
The one opinion from their own psychologist, they argue, is sufficient. A second opinion, prosecutors argued in requesting a second opinion, is necessary. "At present," they wrote, "the only information the Court has before it is the testimony of the defense expert herself based only on her own examination of the defendant. This Court cannot make an informed decision about the reliability and competence of the defense expert's conclusions based on that expert's word alone." Arraf is among the attorneys listed on the brief. She formally joined the defense team last week. She served as interim board chair for the Free Gaza Movement, which advocates for a Palestinian right of return "without delay to their homes in Israel and the occupied Palestinian territories." Creating such a right would threaten to flood Israel demographically, challenging its existence as a Jewish state. 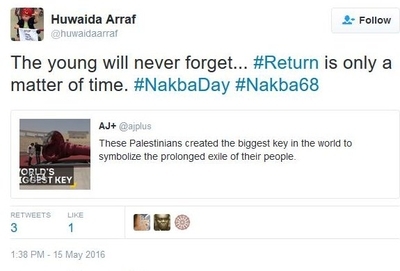 Arraf advocates boycotts against Israel and calls the right of return "a matter of time." The flotilla's objectives and actions were rejected by a United Nations investigative panel. This is striking because of the UN's willingness to condemn Israel often, while overlooking tremendous human rights abuses elsewhere in the Middle East and throughout the world, including Iran, Saudi Arabia, Syria, China, Russia and more. 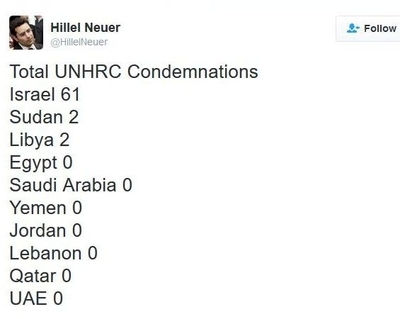 Last year, UN Watch director Hillel Neuer tallied UN condemnations, finding 61 targeting Israel, while the rest of the world garnered only 55 such statements. In its report on the 2010 flotilla, the UN found that the six ships involved carried very little actual humanitarian aid supplies. "The number of journalists embarked on the ships gives further power to the conclusion that the flotilla's primary purpose was to generate publicity," it said. In addition, "the flotilla rejected offers to unload any essential humanitarian supplies at other ports and have them delivered to Gaza by land. These offers were made even during the voyage." Investigators found evidence that Hamas planned a reception for the flotilla. In her lawsuit against the Israeli government, Arraf alleges she was "arbitrarily detained and forced to adopt a kneeling position while being hooded for an extended period of time and placed in handcuffs that were too tight." The UN report, however, called it "a dangerous and reckless act" to "deliberately seek to breach a blockade in a convoy with a large number of passengers." Worse for flotilla advocates, the UN acknowledged that "Israel faces a real threat to its security from militant groups in Gaza. The naval blockade was imposed as a legitimate security measure in order to prevent weapons from entering Gaza by sea and its implementation complied with the requirements of international law." That threat endures, as Hamas openly digs as many attack tunnels along its border with Israel as it can, at the cost of diverting materials that could be used to build housing for Palestinians and restore its crumbling infrastructure. Arraf's lawsuit claims the blockade is illegal despite the UN finding to the contrary. Now she's helping Odeh, convicted of killing two Israelis and more recently convicted of lying about it to U.S. immigration officials, argue that a wholly unsubstantiated claim – Odeh's supposed torture in Israeli custody and resulting PTSD – should be accepted by the court and presented to a jury unchecked. Prosecutors describe Odeh "as the principal architect" of the 1969 bombing which killed students Leon Kanner and Edward Joffe. And Odeh's statements over time contradict the current defense claim that she is emotionally incapable of discussing it. In her first trial, and in a 2004 documentary, Odeh presented dramatically different stories about the 1969 terrorist bombing, her role in it and her ability to remember it. Naturalization forms ask whether the applicant has ever been arrested, convicted or imprisoned. The word "ever" is set off in bold, upper-cased letters. Barred by court rulings against invoking the PTSD claim, Odeh testified that she thought the word "ever" applied only to her life in the United States, and not before. Had she understood the questions better, she would not have hesitated to mention her Israeli record. "It's not [a] secret that I have been in the jail," she testified. "Everybody knows." And while she says she has difficulty thinking about that trauma, she claims specific memory of her naturalization interview more than a decade ago. The immigration official who interviewed Odeh testified that she clarifies for all applicants that the question applies to "anywhere in the world." Odeh insisted she remembered the interview and this did not happen in her case. She is equally adamant in claiming she is not guilty of the terrorist bombing. But in the documentary, which came out the same year Odeh applied for naturalization and claimed to have no arrest record, she visited with a co-conspirator in the 1969 Supersol bombing. Odeh sat and listened as her friend said it was Rasmieh who "dragged me into military work" and who was more involved than I was" in the grocery store bombing. She described scouting the targeted supermarket in terms that matched the confession given to Israeli authorities. That confession, Cornell University Law Professor William Jacobson first noted, came a day after her arrest, long before the abuse she now alleges took place. Odeh says she broke after 25 days of torture. But given the chance to make a torture allegation in 1969, Odeh's father had little to say. An American consulate official who met with him while she was in custody reported "uncomfortable, overcrowded jail conditions, but he apparently [is] receiving no rpt [repeat] no worse than standard treatment afforded majority detainees at Jerusalem jail." In addition, Odeh discussed her role in the Supersol bombing, and in a second bombing at the British Consulate that caused only property damage, in a 1980 Journal of Palestine Studies article that remains online. "Actually we placed two bombs," she said, "the first was found before it went off so we placed another." 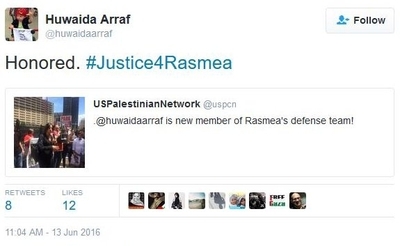 Arraf posted on Twitter that she is "honored" to defend someone who killed two Israelis. That's not surprising. Both should be sitting is Israeli prisons for the rest of their lives, not using a US court to gain entry into this nation. This nation allowing such people to remain on US soil is insanity, it's not justice.